In support of future long-duration space flight missions, CSS designed and operated biologically based advanced life support systems for NASA at the John F. Kennedy Space Center (KSC) in collaboration with the Ames Research Center, Johnson Space Center, and through a NASA-Corporate Space Act Agreement (SAA). 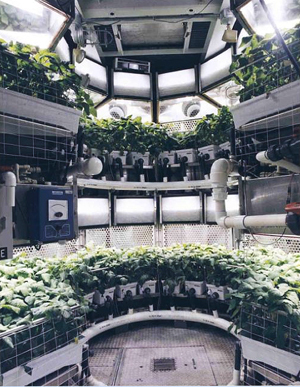 We helped develop and test biomass production systems and bioreactor-based waste recovery systems that could support future crews on space flights through food production, air revitalization, water and waste recycling, and cabin CO2 scrubbing. The work emphasized advanced lighting systems, control systems, crop selection, nutrient delivery systems, plant growth processes, microbial population dynamics, grey-water recycling and solid waste recovery. The multiyear project evolved from bench-scale and breadboard studies to full-scale demonstrations and testing of subsystems in low-Earth orbit aboard the Space Shuttles and International Space Station. CSS staff published more than 50 peer-reviewed scientific papers and received multiple patents associated with this research.